Over the past 6 months my skin has slightly changed. It used to be just oily but now it ranges between oily-combination. I have oily skin on the outer corners of my nose and my chin then I sometimes get small dry patches on my cheeks. My forehead is normal. I have recently got into a routine that works perfectly. It helps to reduce shine and it helps prevent dry patches. 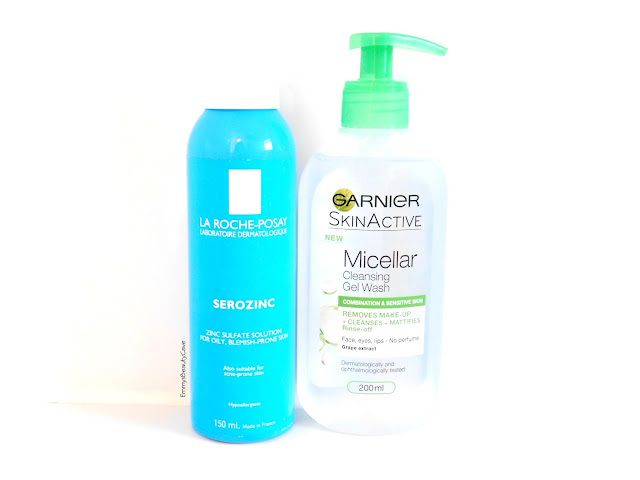 I was using the Garnier Micellar Water ever since it was released but they recently released a gel version. I use the one for Combination and Sensitive Skin. This gel is incredible, I thought I loved the water version but this is even better. You need the smallest amount and when you rub the gel onto your face it starts to foam up. It removes makeup and cleanses your skin. I do still buy the smaller version of the water one to use on my eye makeup. Once I have taken my makeup off and washed my face I spray this toner spray all over my face. It is for oily and blemished skin. It is also suitable for anyone who suffers from acne. It is such a refreshing spray they sinks into the skin quickly. I must be on my 4th or 5th bottle of this serum. 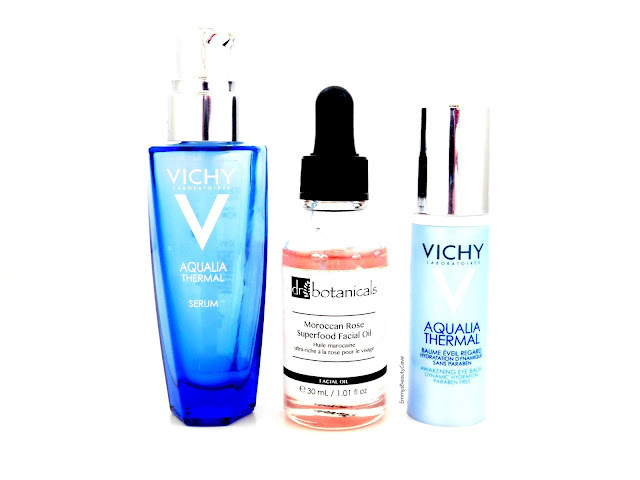 This will work whether you have oily, combination or dry skin. It is extremely hydrating and has definitely improved my skin. When I get dry patches on my cheeks this is the product I rush to use as it instantly gets rid of them. I use this morning and night. I have always struggled to find an eye cream/balm that actually works and makes a difference but this Vichy one is completely different to anything I have tried. It has a gel like consistency and the smallest amount is all you need. I find applying this in the morning works wonders. It helps my dull under eyes look more awake and it smooths the area out well ready for makeup. I have been using this around two months now, I got it in the Bows Beauty Box which included some fab products. This oil is like none I have ever tried. It smells lovely, it doesn't have a strong scent which is what I look for. It sinks into my skin quickly and since using this oil I have noticed my skin doesn't look as dull and my blemishes are slowly fading. I will either use this or the Vichy Serum and alternate each night depending what my skin needs. I have nearly ran out of my second bottle and I already have a third bottle ready to go. If you have combination skin I would definitely recommend this. When I started getting small dry patches I wanted something that would help combat them but also reduce the oilyness. This moisturiser I have used every day for around 6 months! The Body Shops Tea Tree range is a must. I don't use the night lotion everyday, I mainly use this when I get breakouts which is mainly hormonal time of the month breakouts. If im getting a breakout or have a breakout I use this lotion before bed and the breakout goes within 1-2 days! 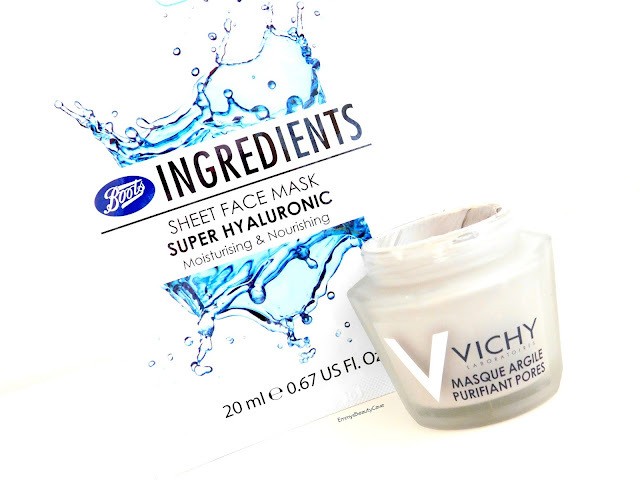 Boots recently released their own range of sheet masks which I think include around six different masks but they only sell a couple online but most stores sell the whole range. 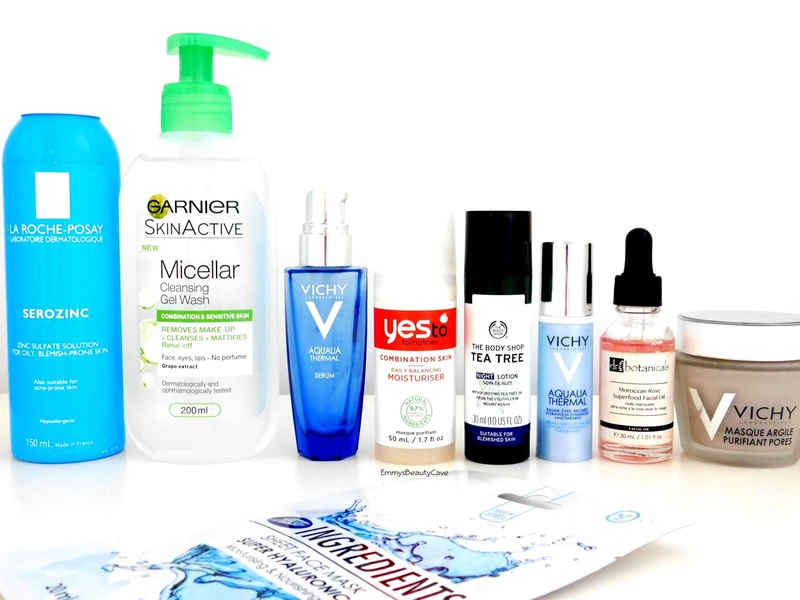 I have been using the hydrating one once a week and it is honestly giving my skin life. I am obsessed with this mask. I have tried many clay masks but this is by far my favourite. It is a lightweight grey coloured clay mask. I use this once a week and applying mainly in my oily area's, nose and chin. I leave it on whilst I am in the bath and the wash off. It makes my skin feel refreshed and definitely helps with my pores.